The Caspian Sea is the largest lake on Earth by both area and volume, with a surface area of 371,000 square kilometres (143,244 mi²) and a volume of 78,200 cubic kilometres (18,761 mi³). It is a landlocked endorheic body of water and lies between Asia and Europe. It has a maximum depth of about 1025 meters (3,363 ft). It is called a sea because when the Romans arrived for their first time, they tasted the water and found it to be salty. It has a salinity of approximately 1.2%, about a third the salinity of sea water. 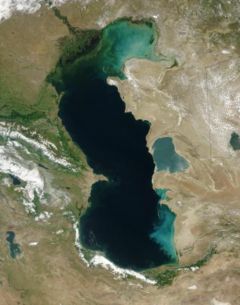 The Caspian Sea is bordered by Russia ( Dagestan, Kalmykia, Astrakhan Oblast), Azerbaijan, Iran ( Guilan, Mazandaran and Golestan provinces), Turkmenistan ( Balkan Province), and Kazakhstan, with the central Asian steppes to the north and east. On its eastern Turkmen shore is a large embayment, the Garabogazköl. The sea is connected to the Sea of Azov by the Manych Canal and the Volga-Don Canal. 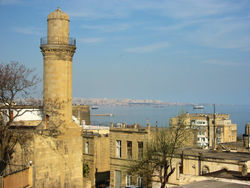 The Caspian Sea, viewed from Baku, Republic of Azerbaijan. In classical antiquity it was called the Hyrcanian Ocean. It has also been known as the Khazar Sea. In Persian antiquity, as well as in modern Iran, it is known as the Mazandaran Sea. Old Russian sources call it the Khvalyn (Khvalynian) Sea after the Khvalis, inhabitants of Khwarezmia. Ancient Arabic sources refer to Bahr-e-Qazvin – the Qazvin Sea. The word Caspian is derived from the name of the Caspi, an ancient people that lived to the west of the sea in Transcaucasia. An aerial view of the southern Caspian coast as viewed from atop the Alborz mountains in Mazandaran, Iran. The Caspian Sea holds great numbers of sturgeon, which yield eggs that are processed into caviar. In recent years overfishing has threatened the sturgeon population to the point that environmentalists advocate banning sturgeon fishing completely until the population recovers. However, prices for sturgeon caviar are so high that fisherman can afford to pay similarly high bribes to authorities to look the other way, making regulations in many locations ineffective. [ citations needed] Caviar harvesting further endangers the fish stocks, since it targets reproductive females. The Caspian Seal (Phoca caspica, Pusa caspica in some sources) is endemic to the Caspian Sea, one of very few seal species living in inland waters (see also Baikal Seal). The area has given its name to several species of birds, including the Caspian Gull and the Caspian Tern. There are several species of fish endemic to the Caspian sea, including Kutum (also known as Caspian White Fish), Caspian Roach, Bream, and a species of salmon. Caspian Salmon is critically endangered. A key problem is the status of the Caspian Sea and the establishment of the water boundaries among the five littoral countries. Russia, Azerbaijan and Kazakhstan signed an agreement in 2003 to divide the northern 64% of the sea among themselves, although the other two bordering countries, Iran and Turkmenistan, did not agree to this. This is likely to result in the three agreeing nations proceeding with oil development regardless; Iranian and Turkmen development is likely to stall. The oil in the Caspian basin is estimated to worth in the region of $12 thousand billion dollars. There are three major issues regulated by the Caspian Sea status: access to mineral resources (oil and natural gas), access for fishing and access to international waters (through Russia's Volga river and the canals connecting it to the Black Sea and Baltic Sea). Access to the Volga-river is particularly important for the landlocked states of Azerbaijan, Kazakhstan and Turkmenistan. This issue is of course sensitive to Russia, because this potential traffic will move through its territory (albeit onto the inland waterways). If a body of water is labeled as Sea then there would be some precedents and international treaties obliging the granting of access permits to foreign vessels. If a body of water is labeled merely as lake then there are no such obligations. Environmental issues are also somewhat connected to the status and borders issue. It should be mentioned that Russia got the bulk of the former Soviet Caspian military fleet (and also currently has the most powerful military presence in the Caspian Sea). Some assets were assigned to Azerbaijan. Kazakhstan and especially Turkmenistan got a very small share (because they lack major port cities). According to a treaty signed between the Persians (predecessor of today's Iran) and the Russian Empire the Caspian Sea is technically a lake and it is to be divided into two sectors (Persian and Russian), but the resources (then mainly fish) would be commonly shared. The line between the two sectors was to be seen as an international border in a common lake (like Lake Albert). Also the Russian sector was sub-divided into administrative sectors of the four littoral republics. Russia proposed a somewhat compromising solution: the seabed (and thus mineral resources) to be divided along sectoral lines (along the two above-described variants), the surface (and thus fishing rights) to be shared between all states (with the following variations: the whole surface to be commonly shared; each state to receive an exclusive zone and one single common zone in the centre to be shared. The second variant is deemed not practical, because of the small size of the whole sea). The Volga River (about 80% of the inflow) and the Ural River discharge into the Caspian Sea, but it is endorheic, i.e. there is no natural outflow (other than by evaporation) except the Manych Canal. Thus the Caspian ecosystem is a closed basin, with its own sea level history that is independent of the eustatic level of the world's oceans. The Caspian became landlocked about 5.5 million years ago. The level of the Caspian has fallen and risen, often rapidly, many times over the centuries. Some Russian historians claim that a medieval rising of the Caspian caused the coastal towns of Khazaria, such as Atil, to flood. In 2004, the water level is -28 metres, or 28 metres (92 feet) below sea level. The last short-term sea-level cycle started with a sea-level fall of 3 m from 1929 to 1977, followed by a rise of 3 m from 1977 until 1995. Since then smaller oscillations have taken place . These changes have caused major environmental problems . The northern part of the Caspian Sea freezes during winter. In the coldest winters ice can also be found at south. When weather is not as harsh icebanks can form in the shallow waters neighbouring the coast.